This wood product is covered by a limited 5 years manufacturer warranty for standard residential use from the original date of receipt. Warranty covers the quality of the construction and material and does not extend to misuse, exposure to chemicals/liquids or improper maintenance. Changes in the wood resulting from exposure to direct sunlight and extreme temperatures are not covered. Highly figured veneers are derived from areas where the tree grows in different directions, causing tension and pulling on the fibers in the wood, which can result in hairline cracks. This is considered an enhancement of the wood and is not covered under warranty. To protect wood furniture, avoid exposure to extreme temperatures, direct sunlight and humid conditions. Do not place near heat sources or open windows. Plastic, rubber and hot objects can cause markings on a wood finish. Do not place objects directly on the surface, we suggest placing a strip of leather, cork or felt underneath accessories. For everyday cleaning, dust with a soft, clean cloth and wipe with the wood grain. You may dampen the cloth with furniture dusting aid or furniture care polish following the manufacturer's instructions. Wipe spilled liquids from the surface immediately with a lightly dampened cloth with the grain. For a more thorough wood cleaning, wash with a mild wood soap. Following the manufacturer's directions, use a soft cloth and wipe with the grain. Occasional polishing with a high quality, non-silicone furniture polish will enhance the beauty of the piece; avoid waxes or oily polishes. Scratches can be treated with scratch remover or furniture touch up sticks. 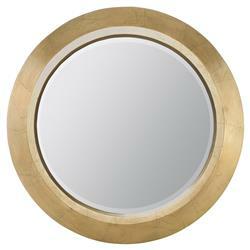 Simply glamorous, the Crawford Regency Gold Leaf Round Wall Mirror brings an elegant air to any space. This polished modern silhouette has an antique gold leaf finish. This round blends glamorous Hollywood with a classic look that is well suited to any home. We love the look of several grouped together on a wall.